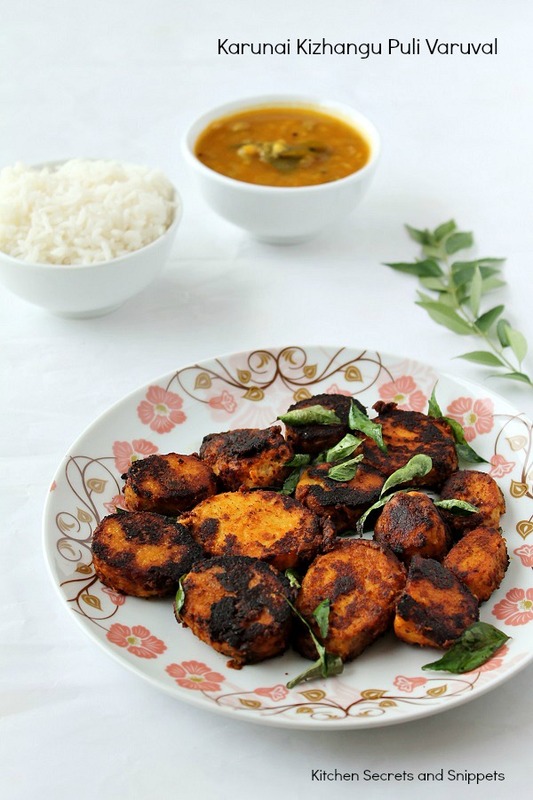 Karna Kizhangu Varuval : This is one of my amma's speciality from her kitchen. Amma makes this fry real good that I would finish as such after it is removed from the tawa. Here, in KL, I get this one variety called pidi karanai every friday, as they are available only on that day since it is imported from India. So, I get all the vegetables here with no hassle and that's what I love the most about KL. 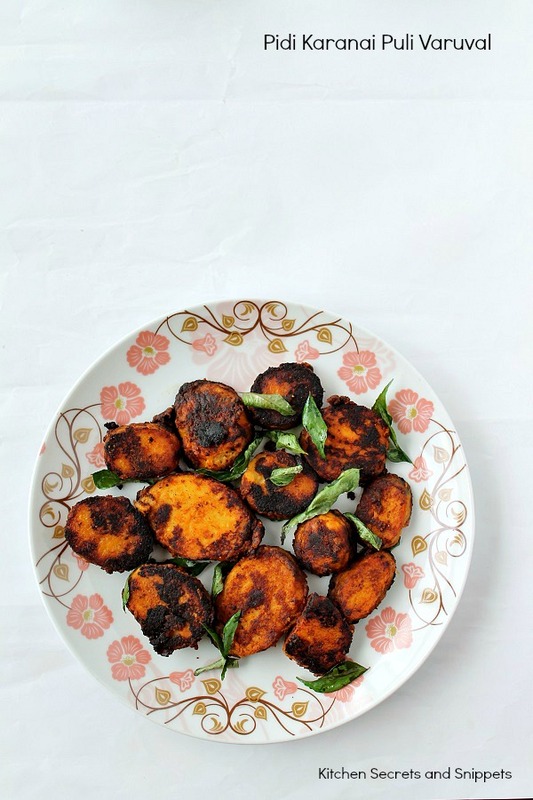 Coming to the recipe, it's just an easy peasy recipe with only one problem, this kilangu gets cooked fast and so the precooking part has to be done carefully, otherwise it's no use of making fry, but u may make kizhangu masiyal and that is on the card to blog about it real soon. Clean the Pidi Karanai and pressure cook for 1 whistle. Once the pressure is released, open the cooker, drain the water and cool the Kizhangu for 10 minutes. 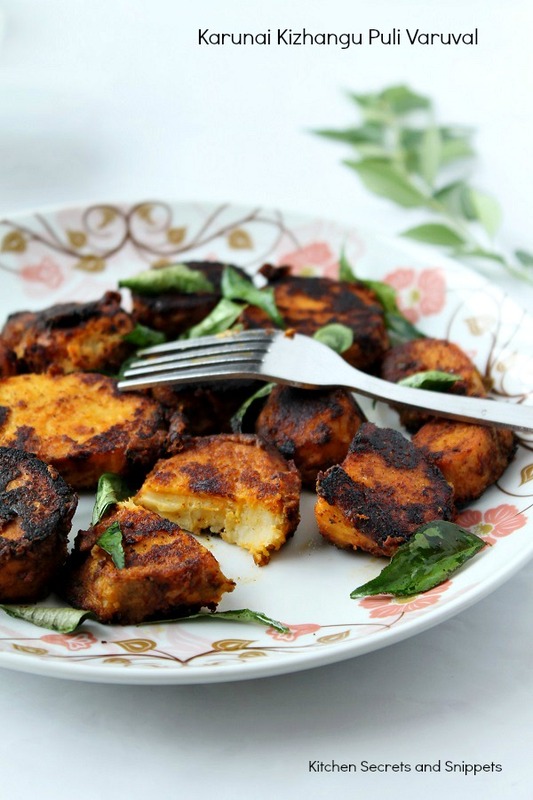 In the mean time, prepare the masala paste by adding red chilli powder , turmeric powder, salt, fennel seed powder ,(coriander and garam masala powder, if using) to the tamarind pulp and make a thick paste. Peel the skin off from the Kizhangu and cut into inch sized bites. Now apply the masala paste, curry leaves to the kizhangu, use the fingers to coat the masala evenly on the Kizhangu. 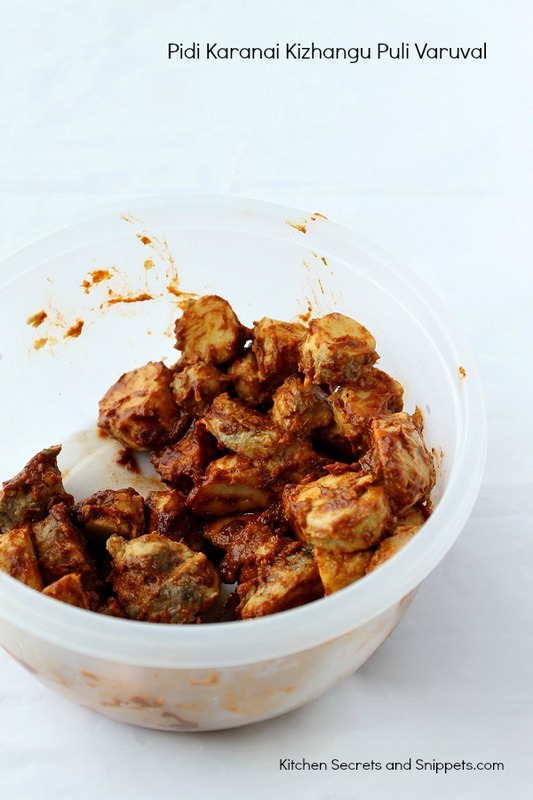 Marinate the prepared Kizhangu in the fridge for 10 minutes to half an hour. Heat a pan with a tbsp of oil, place the slices one by one on the hot pan leaving enough space in between them and fry until it is fried and turns golden in colour. Flip to the other side and cook thoroughly. Serve hot with rice, Sambar. Goes good with almost all the dishes. Varuval looks so delicious and would love to grab quite a few. 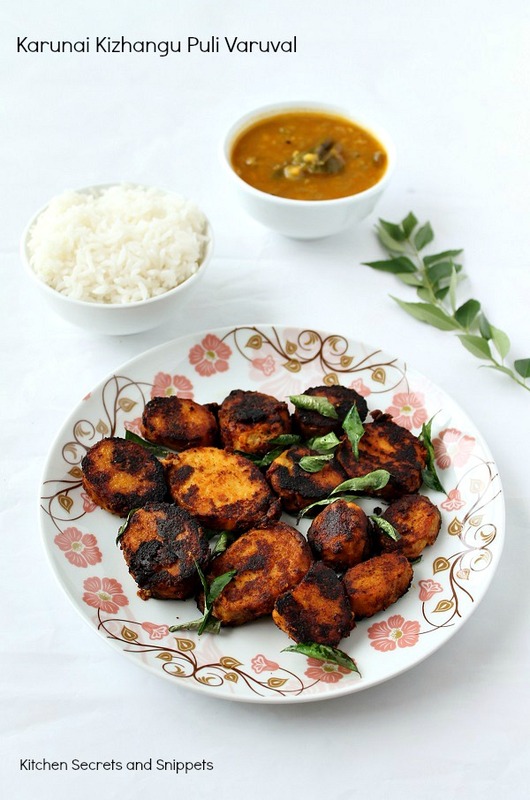 Nice recipe and lovely clicks..
Looks very delicious, would love to finish off the plate. My favourite varuval, love with rasam very much.